On the third anniversary of the referendum to decide whether Greece was to accept the bailout conditions imposed by its creditors, the political landscape of the country looks so much different. Former firebrands Alexis Tsipras and his SYRIZA-led government which orchestrated the referendum and urged people to reject the conditions by voting ‘No’ on July 5, 2015, have since made a huge U-turn, agreeing to a third bailout program and becoming its most enthusiastic supporter. Greece is due to complete the third bailout in August, but critics say that tough austerity measures, including pension cuts will be implemented in the next few years, as the country will enter a long period of “enhanced surveillance” by its creditors. The referendum was announced by Tsipras in the early morning of 27 June 2015, and ratified the following day by the parliament and the president. From the outset, he saw the referendum as a negotiating maneuver. The idea of a referendum that would “strengthen” the Greek position in the negotiations with the Troika had been floated in the spring of 2015. “Our aim is for the referendum to be followed by negotiations for which we will be better armed,” he said in an interview on state television. It was the first referendum to be held since the republic referendum of 1974, and the only one in modern Greek history not to concern the form of government. As a result of the referendum, the bailout conditions were rejected by a majority of over 61 percent to 39 percent approving, with the “No” vote winning in all of Greece’s regions. Supporters of the “No” vote danced for joy in the streets of the Greek capital. But, Tsipras refused to join the celebrations. He declined to make some kind of “victory appearance”, he called meetings with opposition leaders to forge a common position and dismissed Yanis Varoufakis, his finance minister whose six-month negotiating tactics had infuriated his European counterparts. Varoufakis later described the atmosphere in the PM’s office on the night of the referendum as “downcast”, as if Tsipras and his aides dreaded the emphatic victory of the “No” vote. Three days following the referendum, Athens “formally asked for a three-year bailout from the eurozone’s rescue fund and pledged to start implementing some economic-policy overhauls” beginning by mid-July 2015. European finance leaders scheduled a “crisis summit” on 12 July to consider the request. The Greek request included a “drastic turnaround” for Tsipras regarding “pension cuts, tax increases and other austerity measures”. 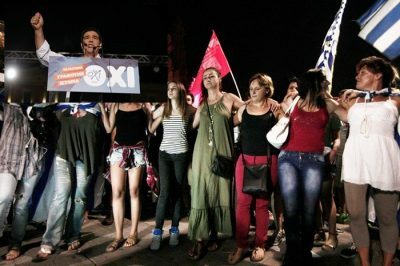 On Monday, 13 July, the SYRIZA-led government of Greece accepted a bailout package that contained larger pension cuts and tax increases than the one rejected by Greek voters in the referendum.